If you watched Sunday’s game between the Indianapolis Colts and Minnesota Vikings, then you probably noticed like I did that it sure looked like the Vikings’ running attack and their defense was going to send the Colts away 0-2; but as I am sure you have heard more than once, appearances can be deceiving. Colts quarterback Peyton Manning was harrassed most of the game, having been sacked twice while throwing 2 interceptions, yet he came up clutch when it mattered most as he led the Colts on a late 4th quarter drive which led to a game-winning field goal by Adam Vinatieri with 3 seconds remaining, leading Indianapolis to a narrow 18-15 victory over Minnesota at the Metrodome. Somehow the Vikings wasted their time management and a very impressive rushing performance by running back Adrian Peterson in the first half, getting 5 field goals by placekicker Ryan Longwell and 3 punts – which seems to point the finger at their quarterback Tarvaris Jackson and his apparent lack of passing acumen. 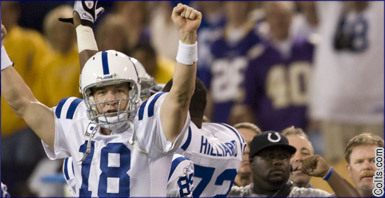 The Colts would come back in the second half with fireworks of their own around mid-third quarter, as Manning would hook up with wide receiver Anthony Gonzalez on a wide open 58-yard completion on 3rd-and-6, of which Gonzalez would lateral to WR Reggie Wayne as the ball was spotted at the Vikings’ 1-yard line. RB Joseph Addai would score from there, despite an unsuccessful challenge by Vikings head coach Brad Childress, narrowing Minnesota’s lead to 15-7. The Colts in the fourth period would, with the help of Manning (no running game to speak of all game), drive down the field from their own 39 with passes of 17,12 and a 32-yard TD pass to Wayne; RB Dominic Rhodes would sneak in on a 2-point conversion, tying the contest at 15. In the final minute, Manning would on third-and-9 complete a pass to Wayne, which would set up the game-winning FG by Vinatieri. The Vikings would try to rally late, but a late pass attempt form Jackson to WR Bernard Berrian was overthrown as Berrian tripped in triple coverage. Jackson had a mediocre effort once again, going 14-of-24 for 130 yards while Manning did markedly better, going 26-of-42 for 311 yards with a TD and 2 INT’s. Peterson had an excellent outing for the Vikings, rushing for 160 yards on 29 carries while catching 4 balls for 20 yards while Addai had only 20 yards on 15 carries for the Colts. Gonzalez led all Colts receivers with 9 receptions and a career-high 137 yards while Wayne added 5 catches for 93 yards and a TD. Bobby Wade caught 3 balls for 42 yards while Aundrae Allison added 37 yards on a pair of receptions. Indianapolis, now 1-1, hope to sustain some momentum as they return home to host the Jacksonville Jaguars on September 21 while Minnesota (0-2) will stay home and host the resurgent 2-0 Carolina Panthers – also on September 21.